Pictures of gold clad giants in Peru's are confimed, but museum denies! Giant head - notice the man standing to the right! On the internet you can see pictures of what seemingly is a mummy of a gold clad giant, taken by Glenn Kimball. I sent an inquiry to the gold museum in Peru and they confirmed that they have the mummy on the pictures in their museum. But on a follow up from me they said that the information from Kimball was false: "Everything expressed in this website is false and without any scientific basis." I managed to get hold of Glen Kimball's son Chase and he spoke to his father about my email and the claim from the Gold Museum: "Glenn is not a liar. He lived there for two years and measured the mummies himself", he replied. Chase Kimball is in his reply to me is pointing out that everytime a skeleton or mummy of unusual size is found scientists claim that they were just deformed, and he says the reason is because it doesn't conform to what they believe to be natural human evolution. He is not the first claiming this and there are of course other implications than conflicting interests from the creationists and the evolutionists: If we should accept that there have existed giants on earth we will, among other things, have to re-write all the history-books! It shall still be possible for everybody go to Lima in Peru and see the gold clad mummies, but this is very seldom the case when it comes to ancient mummies of giant stature. I have found plenty of old new-paper articles about the giants that were found when the first Europeans migrated to America. There were thousands of mounds and many of them had bones of very, very tall people. Many times the bones smouldered to dust when exposed to fresh air, but quite a lot of giant bones were moved to museums and other places for examination. They are now seemingly all lost - and it must be allowed to ask why. Thor Heyerdahl was one of the first in modern time to study the old legends and find that they very often not merely were fairytales, but based on historical facts. There are thousands of legends and religious scriptures telling about giants and Chase Kimball is very much in line with Heyerdahl: "The fact that the stories are found in every culture on the planet means that it is true. There is no way that every single culture throughout history has been delusional", he says. Well, myself I am getting more an more proof that there is something true to the stories about giants. Dr. Paley has confirmed that there was found a giant skeleton in Saudi Arabia, The Humbolt Museum in USA have confirmed that they have the skulls of the Lovelock-giants and all the actual newspaper-articles in New York times confirm that there has been humans much taller than us living on our planet. I have read on the internet that you have a mummy of a giant in your museum (there are also pictures). Can you please confirm this? In fact, this mummy is property or our Museum, but we want to know what is your interest about this picture? "Glenn Kimball photographed the mummies of two of these giant men in Lima Peru in 1969. These giants are still in the gold museum in Lima Peru today and can be seen by anyone who visits. They were mummified because their golden robes are prominently on display. Their crowns could fit around Glenns waist. Their golden gloves have fingers ten inches long. Their mummies can be measured with a tape and they were both around nine and a half feet tall. There were other personal items fit for a giant king, that wouldnt have been useful to a man of normal size. The actual bodies are there incased in glass for all to see." My interest is that there seems to be a more or less secret part of our human history: That there once existed people that was much taller than we are today. The Norwegian Thor Heyerdahl of the Kon-Tiki fame was trying to find out why he could find stories about tall, white and blond "gods" so many places in the world (in two of his latest books before he died he traced the ancestors of the tall, blond Viking kings to the area around Caucasus). I came across the same curiosity when I was doing research on the statues in the Pacific for my Norwegian internet magazine Sydhav ("South Seas") and after that my interest has grown. So I am trying to find proof that there have been living people much taller than we are today. Your area is very interesting, and also Thor Heyerdahl did a lot of research on white "gods" that sailed out into the Pacific (thus "Kon-Tiki"). I hope that you can confirm that your mummies are as tall (more or less) as claimed in the story on the internet (from a museum in USA I have received confirmation on skulls much larger than normal http://www.sydhav.no/giants/lovelock.htm ). When we consult, archaeological and historical data on the Internet, you must be very careful because in most cases this data is FALSE, it is better to use written sources provided by professionals who investigate scientifically pre-Columbian times. This is the case with the website that you have reviewed, as professional archaeologist can tell you that everything expressed in this website is false and without any scientific basis. The arms to those who should be referred to a "giant", corresponds to a context of a tomb at Huaca "Tres ventanas" (Ferreñafe, north coast of Peru "), well documented archaeologically, through the work of Dr. Izumi Shimada and Dr. Carlos Elera. These arms were alongside a glass rattle part of the funerary equipment, has nothing to do with human anthropometry. It's the same case, the tunic was not to be used daily, but for the ritual after death. Pre-Columbian cultures in our world view is very important and must be understood and studied so evaluative judgments. In relation to the skull, has never been studied scientifically, therefore we can not say that is a giant, to respond to this e-mail I have made anthropometric measurements and are NORMAL, in pre cranial deformation was (it was on the business of social condition and status), this was common among many cultures such as the Paracas. The history of giants in our area is a legend, because there is no documented archaeologically any findings about it, none of the great researchers of Peruvian culture as Uhle, Tello, Strong, Willey, Corbett and other documented findings of this type. While Klauss Koshmieder archaeologist at the site of Chichita made some findings of potential "giant" to conduct studies paleopathological was concluded that these individuals were suffering from congenital mal called multiple endocrine neoplasia, having the skeleton one size averages 1 meter with 70 centimeters tall for the standard run for the area is 1 meter 50 centimeters. 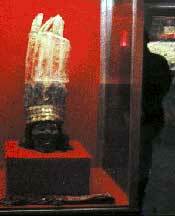 I would like to get in touch with Glenn Kimball concerning the artefacts in the Gold Museum in Lima, Peru. Lic. Patricia Arana Bullónhar (please see beneath) at the museum has told me by email that Kemball's claim on a mummy of giant stature is not true. I would like to know the truth but have no chance to travel there myself (I am a Norwegian living in Australia).